Sarah Palin appeared on Sean Hannity’s Fox News program last night to whine about Vice President Joe Biden comparing the Tea Party to domestic terrorists for their part in nearly collapsing the entire national financial system and throwing the country – no, the world – into a second Great Depression. 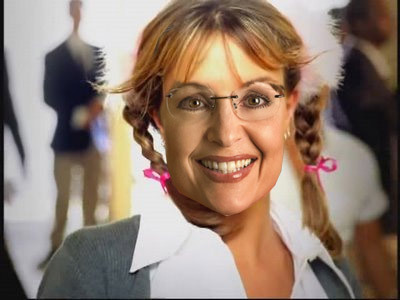 Real talk, we just like the fact that Palin defends herself with Britney Spears lyrics around the 2:30 mark. Fun! So don’t go printing up those “Hit me baby one more time. Call me a terrorist again. Call me a racist.” stickers now, you hear? Because Sarah Palin will NOT be wearing one on her forehead. Not that you would be able to read it very clearly what with those bangs in the way.